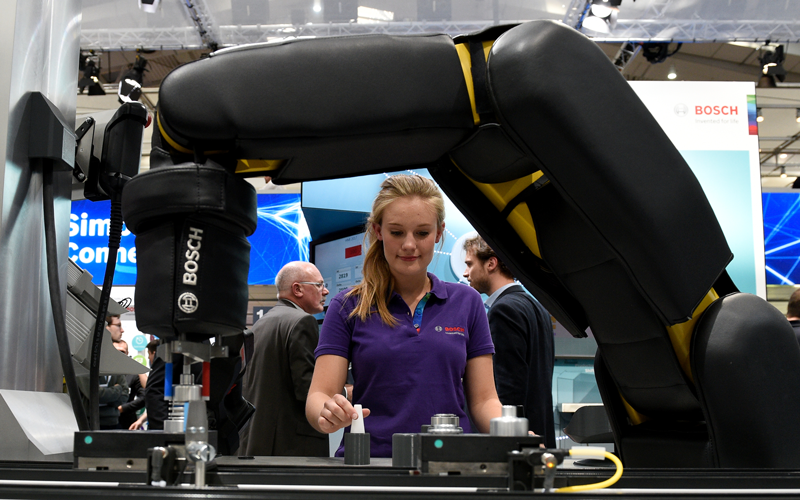 This year’s HANNOVER MESSE had the clear objective, to make the benefits of digitalisation tangible, and after five action-packed days at the world’s leading trade fair for industrial technology, the organisers spoke about the thriving event. A large number of solution-seekers gathered in Hannover to immerse themselves in the potential of intelligent robots, adaptive machines and integrated energy systems, taking attendance to new heights. The show’s chosen lead theme of ‘Integrated Industry – Creating Value’ put a major spotlight on the benefits of Industry 4.0 and the role of humans in tomorrow’s integrated factories. As this year’s featured Partner Country, Poland called added attention to the need for close cooperation throughout Europe, while impressing attending professionals with its credentials as an innovative partner to global industry. A new generation of robots was also in the limelight: the so-called ‘cobots’, (collaborative robots), which are about to fundamentally transform the way we work in factories. Their connectivity, artificial intelligence, innovative sensors and intuitive operation allow them to communicate directly with humans, as they learn autonomously and swap instructions with other cobots. Previously sensors were viewed as the main technology item connecting up different machines, but this year’s event put platform solutions to the fore. Concretely, this refers to cloud-based network connections for the entire production operations, including data collection and analysis. “The trend towards the ‘digital twin’ concept in the production environment is opening up entirely new vistas for industry,” reported Köckler. If testing can be carried out in virtual reality – for example, to see whether a new production line is going to work out – this makes it possible to bring products onto the market faster, at a lower cost. The main focus was on new energy storage technologies, which included serial production-ready electrolysis stacks, making hydrogen solutions a viable alternative even today. Some totally new approaches were also in evidence in the solar technology area, with several companies displaying ultra-thin, flexible solar foils that generate electricity even in low-light conditions, opening up new options for the practical application of the technology. Another example consisted of Salzgitter AG, which presented a coordinated display at HANNOVER MESSE underscoring how Industry 4.0 and digitalisation have changed the way they see their business, and the solutions that are already in place. Following on the heels of last year’s successful launch, the ‘Young Tech Enterprises’ segment of the fair enabled young businesses to introduce themselves to potential investors, customers and partners. More than 150 startups were on hand, exhibiting storage devices for renewable energy networks, operating systems for augmented reality and mini-wind power plants for cars and trains: “The startup area of the fair is going from strength to strength. We are confident that many of them will decide to take the plunge next year with their own stand at HANNOVER MESSE,” added Köckler. Featured as this year’s Partner Country, Poland sent a total of 200 companies to Hannover, highlighting the country’s strong credentials as a dynamic and innovative industrial location. Research and startups are a special priority for the Partner Country. This was the message conveyed by Polish Prime Minister Beata Szydlo in her address at the HANNOVER MESSE Opening Ceremony, and these themes were also at the forefront of the exhibits during the event. Poland also succeeded in underscoring its leading position in eMobility. The high degree of interest in HANNOVER MESSE among Polish political circles was confirmed by the presence of such high-ranking delegates as Jarosław Adam Gowin, Polish Minister of Science and Higher Education, and Mateusz Morawiecki, Minister of Economic Development and Finance. Beginning in 2018, the annual Industrial Automation (IA) show will merge with the biennial Motion, Drive & Automation (MDA) – both representing leading fairs staged under the HANNOVER MESSE umbrella. IA and MDA will then take place jointly under the new name of ‘Integrated Automation, Motion & Drives’ (IAMD) – reflecting the entire spectrum of industrial automation, power transmission and fluid power at HANNOVER MESSE. Beginning in 2018, CeMAT, the world’s leading intralogistics trade fair, will be staged every two years in parallel with HANNOVER MESSE. “Production and logistics processes are in the process of becoming intelligently integrated, enabling even more efficient, flexible production processes. At CeMAT we will be making this integration tangible and will demonstrate the resulting potential,” said Köckler. Additional display sectors at CeMAT include logistics solutions for retailing and logistics services. “Efficient logistics processes are of critical importance to the business success of online retailers or bricks-and-mortar retailers. At CeMAT they’ll find the right logistics systems for omni or cross-channel solutions,” added Köckler. CeMAT and HANNOVER MESSE will be a strong duo next year, providing a platform for international decision-makers from industry and logistics. The next HANNOVER MESSE will take place 23rd-27th April 2018, with Mexico as its official Partner Country. What’s in store for Hannover Messe 2019?